Clemson has a perfect 6-0 record against UNC-Asheville and a 43-1 record against Big South teams. 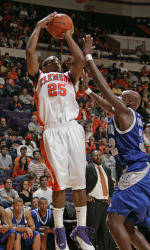 Clemson last met UNC-Asheville in 1998-99 and the Tigers won 73-64. UNC-Asheville is coached by Eddie Biedenbach, who is a 1968 NC State graduate. Biedenbach once scored 29 points in a game against Clemson in Charlotte in 1968 and his Pack team had a 4-2 record against the Tigers in his career as a player. Clemson has a 70-14 lifetime record in the month of November and has won nine consecutive games, including the 98-54 win over Hampton in the season opener. Clemson’s 44-point victory over Hampton in the opening game was the largest margin of victory for the Tigers in any game since a 77-28 win over Wofford during the 1995-96 season. Clemson’s four freshmen combined for 39 points and 16-24 shooting against Hampton. It was the most combined points for a Clemson freshman class in a season opener since the 1995-96 season when the seven frosh that season (including Terrell McIntyre, Harold Jamison and Tom Wideman) combined for 50 points in a 42-point win over UNCA. Oliver Purnell has a 3-5 lifetime record against UNC-Asheville. All eight of those contests took place when he was the head coach at Radford. Clemson had a school record 25 steals in the victory over Hampton to open the season. It is tied for the second most steals in a game in ACC history for one team. The Tigers also forced 37 turnovers, third highest single game total in Clemson history. The Tigers scored 44 points off those 37 Hampton turnovers. Shawan Robinson and Akin Akingbala both are coming off career high scoring performances. Robinson scored 26 points, including 22 in the first half against Hampton. Akingbala scored 11 points in the win over Hampton. Sharrod Ford has 12 career double-doubles, tied for third among active ACC players with Julius Hodge of NC State. Shelden Williams of Duke (17) and Sean May of North Carolina (16) are the only active ACC players with more double-doubles than Ford entering this season. Clemson had 41 field goals in the win over Hampton. The Pirates had just 42 field goal attempts. The Tigers scored 57 points in the first half, including 22 in a row at one point, the longest streak of consecutive points scored in the 29-game Purnell era. Clemson will go on the road for the first time on Friday when the Tigers face Boston College. It will be Clemson’s first ever game in Massachusetts. Clemson vs. UNC Asheville Series Clemson holds a 6-0 lead in the series with UNC-Asheville, but the two teams have not played since the 1998-99 season, Larry Shyatt’s first year in Clemson. Clemson won that last meeting at Clemson 73-64, a closer game than expected considering Clemson was ranked 17th in the AP poll entering the game. The two schools first met in 1979-80 at Clemson in the regular season finale, a game that was also senior day. UNC-Asheville held the ball much of the game, a contest played in the pre shot clock era, and the Tigers came away with a 38-27 victory. That was the “Senior Night” game for Bobby Conrad, Billy Williams and John “Moose” Campbell. It is the fewest combined points (65) for any Clemson game since the 1945-46 season. Clemson also gained victory in 1986- 87, 1989-90, 1991-92, 1995-96 and the aforementioned 1998-99 season. You can see by the list that UNC-Asheville has caught Clemson during good seasons. Clemson has been to the NCAA Tournament just seven times in history, but UNCA has been on Clemson’s schedule in four of those seven. Plus, the 1998-99 Clemson team went to the finals of the NIT. Clemson’s 1979-80 team advanced to the Final Eight of the NCAA Tournament, the only Clemson team in history to advance that far. The 1986-87 team featured Horace Grant and won a school record 25 games. The 1989- 90 team won the ACC regular season title, the only team in Clemson history to do that. Vincent Whitt had 18 points to lead the Tigers the last time the two teams met, a total he recorded in just 18 minutes. Harold Jamison and Terrell McIntrye added 13 points apiece for the Tigers, who shot 27-41 from the field for the game. Clemson vs. Big South This is the first of two games for Clemson against Big South Conference teams. The Tigers will also play Charleston Southern on December 11. Clemson has a 43-1 lifetime record against Big South Conference teams with the only loss coming to Winthrop, a 66-61 Eagles victory during the 2001-02 season at Littlejohn Coliseum. UNC Asheville Opens with Loss UNC-Asheville opened the season with a 119-55 loss at Texas Tech and Head Coach Bobby Knight last Saturday evening. The Bulldogs had three players in double figures, led by reserve center Joseph Barber who scored 13, and starting forward Oliver Holmes who added 12 points. UNC Asheville committed 26 turnovers and was outrebounded, 51-26, in the loss. Eight players scored in double figures for Texas Tech, led by Curtis Marshall, who scored 30. UNCAsheville returns five starters and 11 lettermen from last year’s team that finished with a 9-20 record. Biedenbach Played Against the Tigers UNC-Asheville Head coach Eddie Biedenbach is a 1968 NC State graduate who played six games against Clemson in his career with the Pack. NC State won four of the six contests. He scored in double figures in each of his last four games against Clemson, including a 29-point performance on Feb. 17, 1968 in Charlotte in a 69-67 NC State victory. Biedenbach played in 73 games for NC State between 1964-68 and scored 976 career points. He was a 73 percent free throw shooter and led the Pack in scoring in 1965-66 and 1967-68.